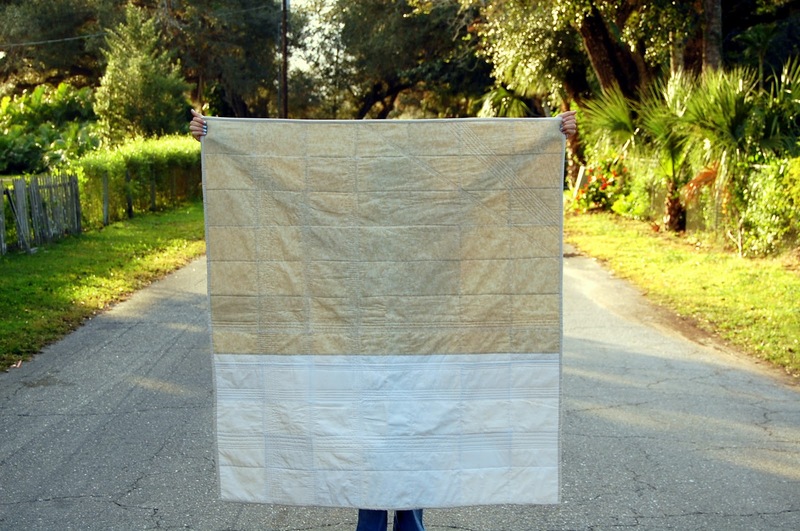 I set out to create some larger-than-small (ie - lap size) quilts that focused on texture more than color. 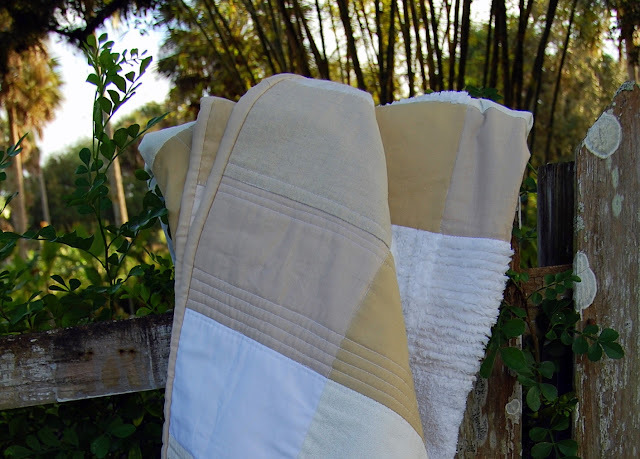 White and shades of neutral whites and lights with diversity in fabric, character, and depth. As someone said, a more organic feel. Instead of squares of fabric I used simple rectangles. 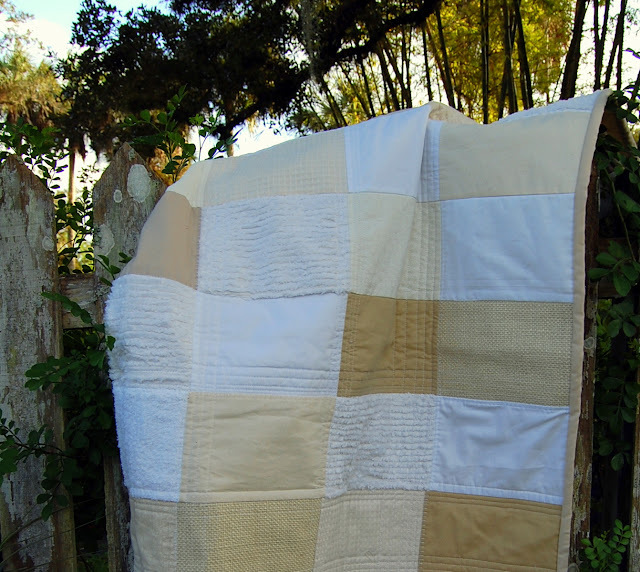 Fabrics include linen, chenille, simple cottons, muslin, batik cotton, tea stained chenille, terrycloth, and burlap. Yes, muslin ... which felt like cheating as it's one of the simplest of fabrics, but it was right for this. And yes, burlap. 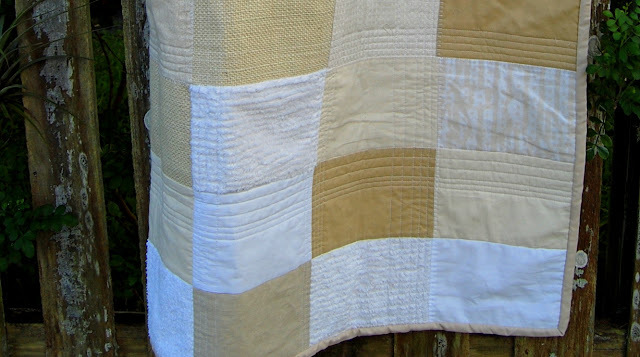 Not standard quilting fare, but when backed with a white cotton it's a great addition to this quilt. 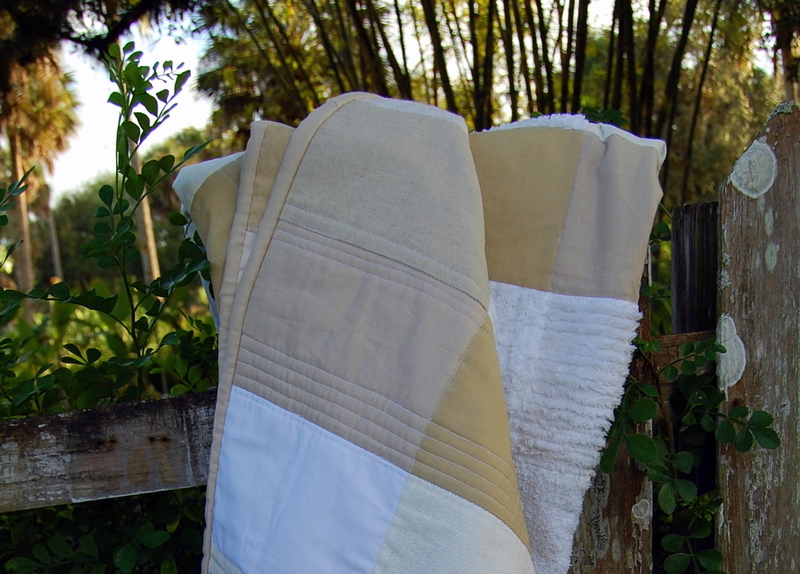 I wanted the fabrics to be simple yet intriguing, soothing yet a bit complex. The quilting on this is done with straight lines, groups of them randomly spaced. Occasionally a row of machine sewn "blanket stitches" are added in. The quilting in one quadrant is done on the diagonal, to add a bit more character and voice to the quilt. Mia and I left home with this quilt and his two siblings (three very similar, but different quilts ... the other two will be posted about later this week) in search of an old barn or rusty falling apart old outbuilding to use as a backdrop -something natural, organic-ish. Apparently those can't be found on every street corner - at least not without "No Trespassing" and "Don't Steal From Me and I Won't Shoot You" signs. As we were meandering and searching I remembered a street I'd thought would be a great backdrop for people pictures. We headed there to see if it would work and were able to take most of the pictures of these three quilts there. The street is canopied by trees and Spanish moss, just a gorgeous "Old Florida" feel. Along the sides of the street are old fences, cow fields, and even a native plant nursery. We couldn't have asked for more (save an old barn). 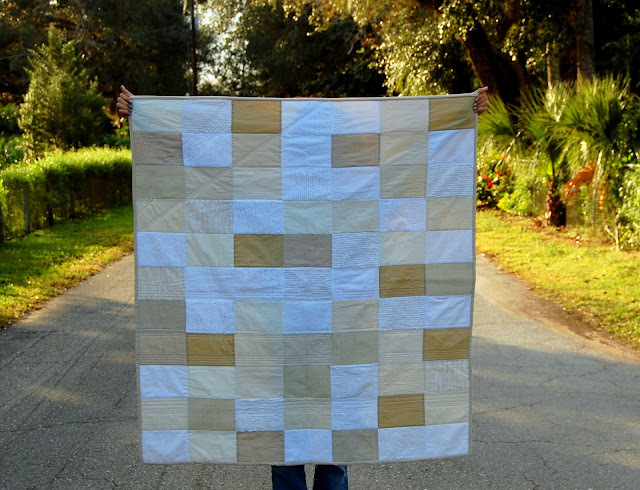 These quilts are available in the shop. Hi Mia! She was an awesome helper, tired by the end but we took a lot of pictures.